It is just over one year ago Viva was diagnosed with Cushing's disease. And all that time she thrived on the prescribed daily medication - 120mg of Vetoryl, or Trilostane. Every quarter Viva was tested and the results were excellent. Such a test consist of an ACTH stimulation test and full blood-work. Viva's liver, battered by her Cushing's disease before we started treatment, was slowly but determinately recovering. Meals: how fast did she eat her meal? Walks: after how long did she tire? Play: did she play with Kenzo? And who initiated? Cuddle: did she exchanged her infamous ear-nibbles with Kenzo? Greets: did she wagged her tail so her back moved? The list is specific to Viva. Like when she wags her tail a little less and the walks get shorter, we know we are up for an acupuncture session for the spondylosis in her back. So when the diary started to show a little less play and cuddles, we advanced her quarterly Cushing's test. And although Viva's cortisol levels related to her Cushing's were still perfect, the rest of her body and organs clearly were feeling unhappy as the blood work showed. This meant we were looking at something new, or the Cushing's medicine - which is very aggressive and can be compared to chemotherapy - was giving side-effects. Based on what we knew from the diary and the lack of other symptoms we decided together with the vet to lower the doses of Viva's Cushing's medication. The most reasonably assumption was the doses was affecting her health adversely despite it kept her cortisol in place. It took only a week for the diary to show us the first positive effects, and when we re-ran the Cushing's test at the end of that month, her cortisol level was still within the limits while her blood-work showed a lot of improvement on all area's. Would the diary not have shown any improvement, we of course would have been right back at the vet's again, discussing other options. 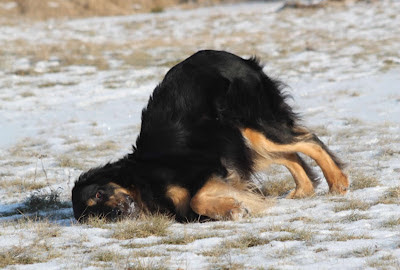 Having a dog with chronic diseases requires a chronic attitude. At first, it stressed me out having to watch everything she does through symptom-glasses. But now that I accepted what a chronic disease requires, it doesn't stress me out anymore. I became even more connected with Viva than before, and know she is living her life to the fullest despite the odds. That's just a terrific bonus, being able to give that to Viva. We are back at the beach in Kijkduin, Holland. Kenzo is having a blast. Jumping waves, swimming, fetching, taking muddy baths and enjoying his pal Joska. Viva is not on the video - too many dogs for her on the beach - but she is doing great too. Lots of walks, and she behaves well with the occasional dog she meets. Greetings from Holland! 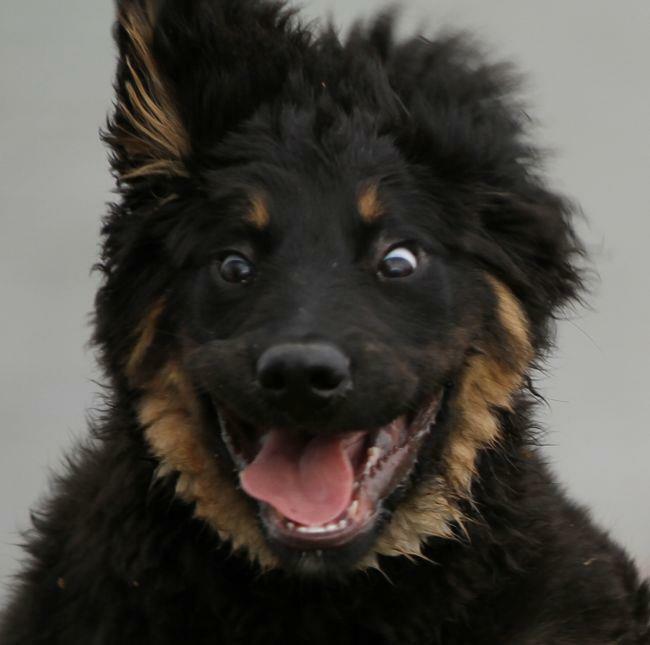 Did you already joined the Facebook group Hovawart Crazy Face ? I have been reading up on my Hovawart book list. Before you continue reading, first a disclaimer: picking up one of these books in your language might very well be your very first step towards your first Hovawart, so beware before you order or borrow. You have been warned. Let's start with the must-read. 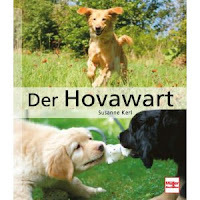 Susanne Kerl's "Der Hovawart", in the new 2012 edition. Unfortunately only available in German. But that shouldn't stop you, more about that later. How Many Hovawarts Fit In a Car? No, not three, that would be too easy. The trailing picture of the video is misleading. Have a look, and let's acknowledge that is one fearless toddler opening the hatch. I have to hide this video very carefully, as it spoils my whole argument for the need of a bigger car for Kenzo & Viva. This good-looking boy on the picture to the left is a Hovawart too. Meet Rico, a "wildmarken" Hovawart. What? you might think, did I not tell you on this blog they are either black, blond, or black-and-tan. True, I did. Let me explain what happened. In short, what happened was the German Kennel Club and the FCI.